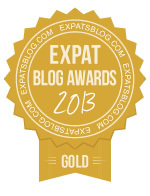 ExpatsBlog.com Expat Blog Awards 2013: Belgium Gold Award! This blog won the Gold Award for best expat blog in Belgium! 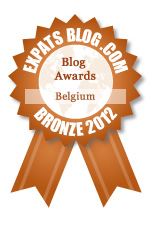 ExpatsBlog.com Expat Blog Awards 2012: Belgium Bronze Award! This blog won the Bronze Award for best expat blog in Belgium! We love whyiamnotskinny's excitement about restaurants, cooking, festivals and friendships. She has a beautiful way of bringing together friends from all over the world---which is why we follow her in America even after we moved home from Brussels! Excellent blog - very well written in informal but accessible language, very descriptive content outlining the blogger's food experiences - generally very entertaining! This blog keeps my tummy filled with chocolate and my heart filled with love. Every BLOG written by 'whyiamnotskinny' is entertaining and filled with passion and the obvious love of food which i share with the blogger...i cant wait to visit Brussels and experience some of these 'YUM' restaurants!!! I wish this blogger would bring out a book as her style of writing is unique and always entertaining! I love this blog! I've made several of Max's recipes and they're always delish. I also love her wit and writing style; she writes as though she's talking to a friend. In all, a fab droolicious read. i just love reading Maxine,s wonderful descriptions of restaurants and food, and am also "not skinny", as am tempted by her inviting recipes. This is my daily fix! I cannot survive without it - it makes me smile, it tantalises my taste buds and it gives me food for thought, body and soul! What more could I ask for. Max simply has a way with words and food. She inspires one to sample, taste and experience what she loves best. I simply love to read about her wonderful experiences and am lucky enough to be apart of some of those. Whyimnotskinny is a heartfelt blog and an excellent read every time. An utterly enticing, *moutwatering* blog: the photos, the descriptions, the humour ... it is all delectable! My appetite for this blog is insatiable. It is a perfect example of what blogs should be: informative, personal, funny, insightful - it leaves you longing for more. Please keep dishing it up! Why I am not skinny? I blame it all on this website and I am proud of it. Recently I tried the banana and walnut bread, and that convinced me that this website deserves to be rated with 5 stars. I enjoy the writing style very much, it is a pity I don't live in Brussels, otherwise I would have tried some of the restaurants too! Great stuff! Perfect for expats, whyiamnotskinny helps us break out of our comfort zones and try new places. Anywhere that gets a good review for customer service is going to be a must-try. And as for the recipes - I'm buying a new kitchen to be able to try them out and start entertaining myself, that's how good they are!!! Great foodie tips, awesome restaurant reviews and of course entertaining. Whyimnotskinny is a must read for any hungry expat in Brussels. Really makes me want to visit Brussels and travel to Europe. Great recipes too, a nice mix. As a non-expat living in the Brussels area, whyiamnotskinny's is giving me new insights and a lot of ideas. Through the blog I discovered a lot of new places in my capital. Keep enjoying the Belgian savoir vivre and all the delicious food you'll find near Brussels... and keep writing about it of course. As a former expat, this blog brings back great memories of my days living in Brussels. She has a great writing style and I love the pictures, stories and recipes. Reading whyiamnotskinny always brightens my day! Your Name Do you think this blog has what it takes to be listed at the top of Expats in Belgium Blogs?